We are nearing the one-month mark of our g-tube free trial. For the first 20+ days, Charlotte met all of her benchmarks, consistently averaging enough calories (combined fluid and solids) not need the tube. Additionally, she has begun to run to the table at mealtime, ask if she can carry things to the table, and feed herself the first several bites if she’s really hungry. Part of this behavior is evolutionary (it was beginning at the end of last year). The first hurdle: As we got to week three of our tube-free trial, Charlotte came down with a cold which then turned into a cough. 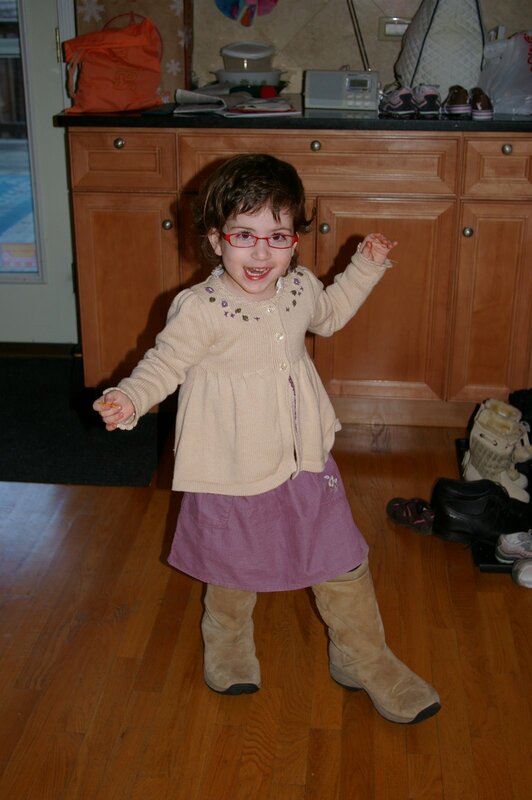 Her pediatrician diagnosed her with a-typical pneumonia and put her on z-pac antibiotics. Not surprisingly, Charlotte was pretty disinterested in food for about a week. Even the usual lure of chicken soup “with letters in it” didn’t perk her up. We didn’t force it, let her eat what she would, and tried to pack high calories into her low volume. Within 3 days of antibiotics she was eating eagerly again, though her liquid volume is still down a bit. And, according to our bathroom scale, she didn’t lose an ounce! We have an “official” weight check with the pediatricianon 2/12. Categories: eating, g-tube, reflux | Permalink. This is the post I never ever thought I’d be able to write. It’s bringing tears to my eyes as I type. Today, Charlotte and I rode our bike to the playground (I pedalled, she tickled my tush). As we began our ride home the sun was setting, the temperature was dropping, and the wind picked up. It must’ve dropped 10 degrees in 10 minutes. Charlotte didn’t notice until the last 5 minutes. Mommy Reynaud’s, however, was literally going numb. I took me several minutes to undo the velcro straps on Charlotte’s feet when we got home because my fingers weren’t working. So, I put on the kettle and set about making hot chocolate. Charlotte squealed with delight, “Harlotte have some! !” Not a request, not a command, simply a gleeful shout. It wasn’t mealtime. She wasn’t in her chair. I didn’t ask her to eat. She just jumped at the chance. I’m so proud that it was for hot chocolate!! Categories: eating, reflux | Permalink. I have officially lost count of the number of days without vomit. We’ve definitely broken Charlotte’s world record. We’re not counting little bitty urps (wet burps, really). Yesterday we did not use the feeding tube at all. If I remember correctly, we didn’t use it on Saturday either. And I cannot remember the last time we took the Zevex pump out of the cabinet. Dare I say that the reflux is behind us? Categories: eating, Feeding, g-tube, reflux, tube feeding, vomiting | Permalink. 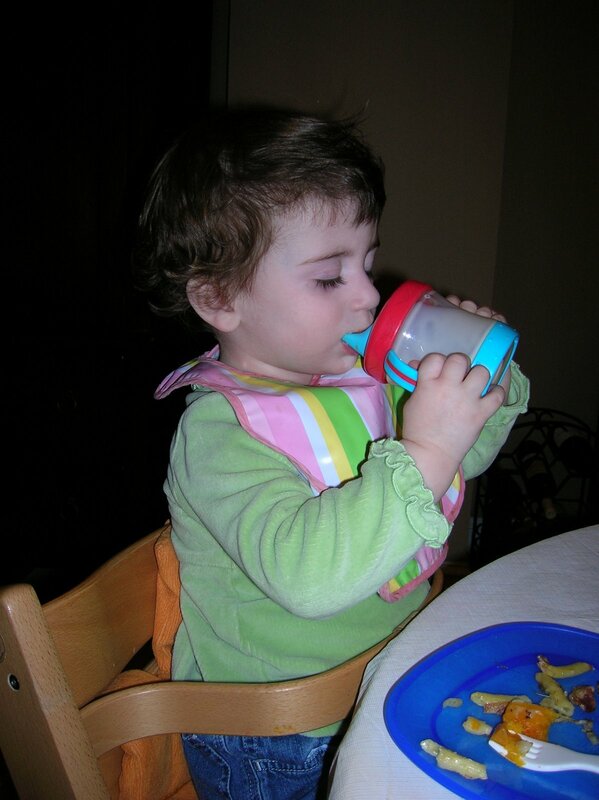 Eating: Charlotte is still drinking the same amount as last reported, anywhere form 75% to 100% of all of her Pediasure. She’s increased her solid intake significantly, taking as much as 4, even 6 ounces of solid food at a meal. Recently, she’s begun to ask for “chewy” food. She has begun to realize that her food is pureed and she wants to eat Mommy and Daddy’s food or the “chewy” version of her food. Today it was sphagettios, last week hot dogs. We are loving this development. It does, however, present a challenge: She chews very, very slowly and simply cant take in any volume this way so it is an inefficient way to assure her caloric needs are met. An eating anecdote: Last week Charlotte and I didn’t feel well so we had a very slow morning, pajamas until 10:00 a.m., no breakfast, etc. At 10:30 we went to brunch around the corner. Charlotte, whom I’d had on a liquid diet for a few hours, was HUNGRY. She practically grabbed the yogurt out of my hand and had shoveled most of it into her mouth by the time I got my coffee. Then she continued to nibble at toast and drink her milk while I ate my breakfast. She chatted, flirted with the server and bus boy, and burst into song. She was an absolutely dreamy date. It’s hard to remember where we were with feeding a year ago. Here’s a flashback link. For the record, she’s vomited maybe 3 to 4 times in the past 23 days. Last week it was due to either a cold or tummy bug and was hours away from any meal (so it doesn’t count in my book!). Prior to that, she’d eaten so much (voluntarily) that I think she simply had too much in her tummy. Singing: Charlotte loves to sing. She wakes up singing. She sings all day long. She knows the tunes to all her favorite songs and will sometimes make up the words. 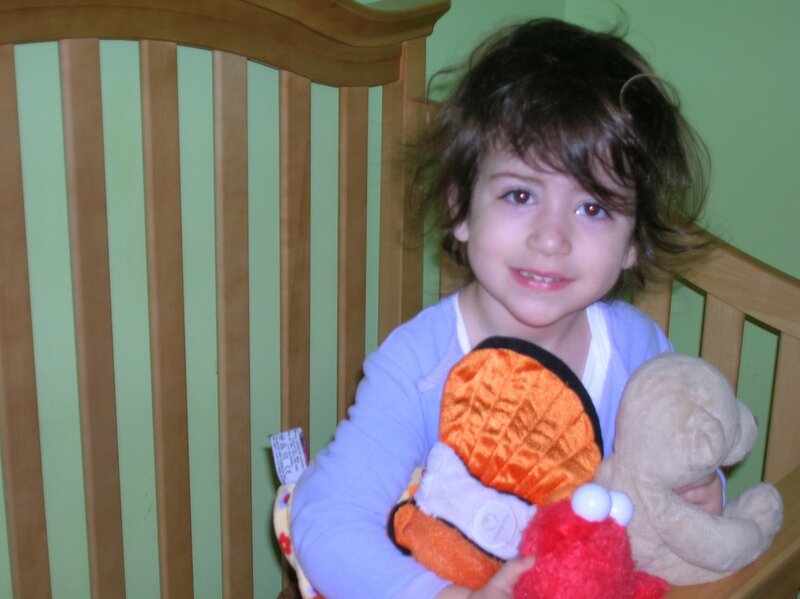 She has a little repertoire of songs for which she knows some words and that she asks for by name (Mamma Mia, Elmo’s ladybug song, Hippo Hippopotome). This past week she started singing words to songs she’s only hummed before: Old McDonald, Au Clair de la Lune, and Momma Mia (“mommy mia, here I go again”). Simply too funny. Growing: At last weight check (Her flu shot on 9/29. By the way, she’d want me to tell you that she didn’t cry for the flu shot. Her daddy says she did. You decide) Charlotte weighed 30 lbs. She’s either holding steady or fluctuating plus/minus 100mg. Dr. Salem, pediatrician extraordinaire, seems unconcerned. We’ll see in 3 weeks what the CHOW team thinks. Categories: CHOW, eating, Feeding, reflux, vomiting | Permalink. On Wednesday, we went to CHOW for a sort of “emergency” intervention with Charlotte’s feeding. Basically, she has started pretending to gag. She forces the gag strongly enough to make herself really gag and then, sometimes, to vomit. Most of the time, you can tell a real gag/reflux episode from a behavioral episode, but not always. I wanted to learn techniques to stop this behavior before she’s in hospital next week because I’m really, really afraid to lose ground on the feeding front in her recovery period. We’ve noticed that when she wants to and is feelign well, Charlotte can drink 7.5 ounces of milk and eat a tablespoon of food. We’re looking for tactics to help make that kind of meal the norm. She forces the gag to try gain control over her feeding, to determine when the meal ends, or to get attention. So, we got to CHOW and she ate like a dream. She dove into her salmon and macaroni and cheese with abandon. She drank all by herself from a sippy cup. 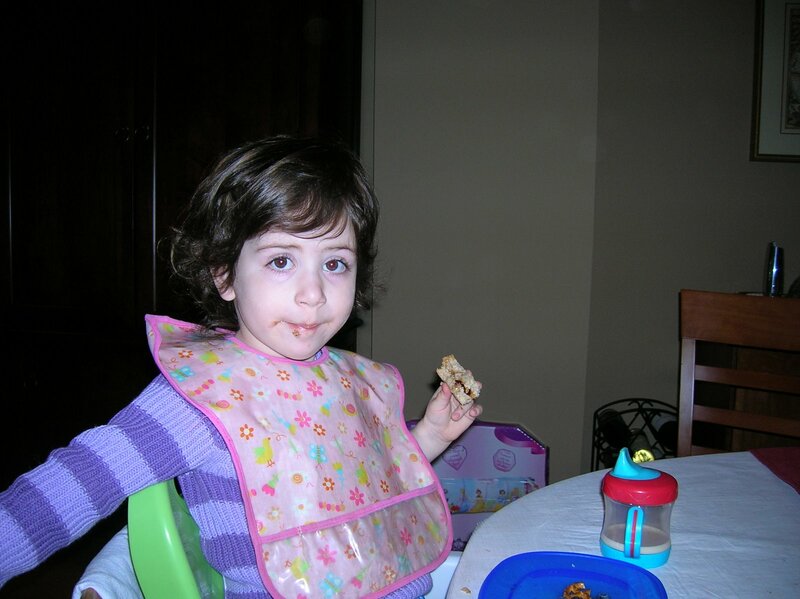 (Now, I know most 22 month olds feed themselves, for the most part. But, remember, if you will, that Charlotte does not.) She was perfectly well behaved. Of course. I told the doctors ahead of time that I was sure she would be an angel for them. When she was done, Dr. Long taught me some techniques to stop the gagging. Basically a) ignore the behavior or/then b) startle her by saying no (much in the same way you’d talk to a puppy about to pee on the floor). Verbally remind Charlotte to chew and swallow while stroking her cheek and throat. Keep the meal short, 15-20 minutes max. And praise, praise, praise when she feeds herself, chews a good bite, etc. Hats off to CHOW. It’s been 4 days and we’re already seeing VAST improvement in her mealtime attitude. Her solid food quantities seem to have doubled since Wednesday and her milk intake is consistently 3-5 ounces in a meal. Fingers crossed that we’ll see this continue after surgery. Categories: Children's Hospital of Wisconsin, CHOW, Feeding, reflux | Permalink.